Mamata Banerjee on 2012 announced new loan schemes, creating an employment bank and promising official stamp on 10,000 madrasas. The announcement comes days after she declared a monthly honorarium and housing subsidy for imams in the state. Outlining schemes undertaken for uplift of Muslims in the state, she said her government had increased allocation for the minorities department by 73 per cent in the state budget for financial year 2012. "Our aim is to see that our brothers and sisters pursue their studies properly, receive training and get jobs. And those who cannot get jobs, can start businesses by taking loan from the government," Banerjee told a meeting organised by the West Bengal Minority Development and Finance Corporation at Barasat in North 24-Paraganas district. Noting that a "comprehensive employment bank" would be set up to cater to the growing job needs of the youths belonging to the minority community, she said it would have its network in every district where there would be a system to enroll names. The chief minister said 'bhavans' will be set up in the districts from where they would get all the assistance required. She also announced loans and stipends to 75,000 students. She also took credit for bestowing the status of the second official language on Urdu in areas where there was concentration of more than ten per cent people speaking the language. 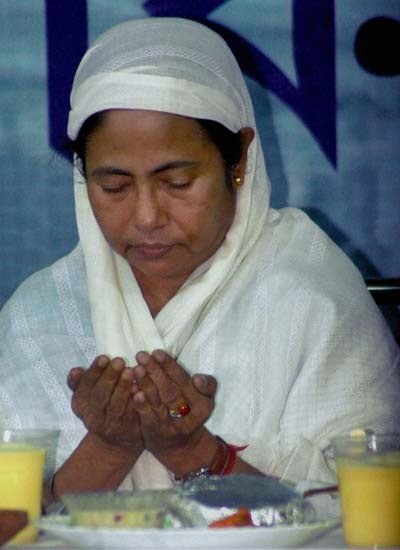 Mamata, who had earlier announced 'Nija Bhoomi, Nija Griha Scheme' under which the state will provide three kotahs of land and money to build a house to the beneficiary, said that within three years there would be no 'homeless' person in West Bengal. She also announced that Rs 2 per kg rice would be given for another six months from now on to cyclone Aila victims. She had announced last Tuesday a package for the imams of the state, which include a monthly honorarium of Rs 2,500, a housing scheme and stipends for their children.